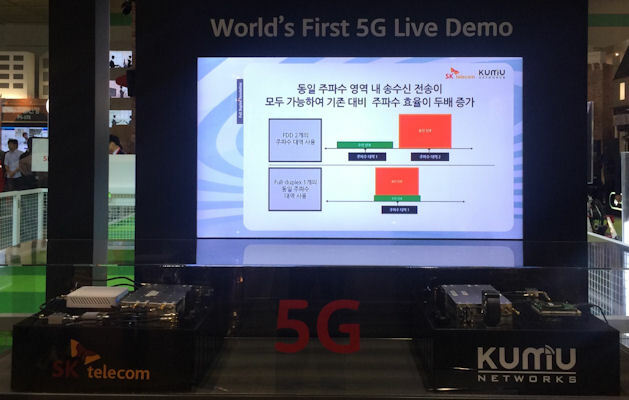 South Korean operator SK Telecom is demonstrating In Band Full Duplex (IBFD), which is being positioned as a potentially key 5G technology, at a tech show in Korea. The technology is developed by US outfit Kumu Networks and is designed to solve the technological challenge of sending wireless signals in both directions at the same time over the same channel. Right now the problem of sending and receiving at the same time is solved by either using two different frequencies (FDD), or by alternating the uplink and downlink on the same channel (TDD). IBFD works by cancelling signal interference in real time, thus allowing constant traffic in both directions (full duplexing). This potentially offers significant spectral efficiency gains, in effect allowing more to be done with the same spectrum. SKT and Kumu have chosen a ‘Robocop’ to demonstrate this spectral goodness and hope the sight of a robot mirroring human movement without latency will bring this somewhat abstract concept to life and illustrate how handy it will be for the impending IoT boom.